Rebreather diver Josh Dykeman swims through “the jet” for the first time a few months after it was sunk in Dutch Springs as a new underwater attraction. I first visited Dutch Springs nine years ago and was immediately in awe of this landlocked gem. On an average weekend hundreds of divers from surrounding states and beyond venture to this Disneyland for diving. It's located in Pennsylvania, which is well known for its sports teams, Amish country and Hershey's chocolate. The quaint city of Bethlehem, where Dutch Springs is situated, is a former steel manufacturing center and was the largest producer of ships during World War I and World War II. Now Bethlehem is known as a Northeast diving hotspot. In 1935 the National Portland Cement Co. began mining limestone from the quarry for use in cement production. Pumps kept water from flooding the quarry. Through the 1970s the quarry continued to produce limestone, but when the company went out of business the pumps were turned off and water rose, creating the 50-acre freshwater lake now known as Dutch Springs. In 1980 Dutch Springs was purchased and made into a scuba diving facility. Today the quarry has grown in popularity and has dozens of underwater attractions as well as an aquatic recreation area and a rock-climbing wall. With a maximum depth of 100 feet, the quarry is an excellent facility for dive training and a reliable place to get underwater when boats can't get offshore due to weather. A diver walks down to one of several of Dutch Springs’ floating docks. Around 30,000 divers visit Dutch Springs every year, and on a typical weekend it's common to meet people from all over Pennsylvania as well as New York, New Jersey, Connecticut, Delaware, Maryland, West Virginia, Massachusetts, Virginia and even Canada. Groups of friends, dive clubs and dive shops commonly set up tents around picnic tables and spend entire weekends here. These giant social gatherings include events, workshops, camping and cookouts. You'll see recreational divers, technical divers, rebreather divers, photographers, divers with propulsion vehicles, and even freedivers working on skills and enjoying the surroundings. The sight of the still water around sunrise, as a light mist rises off the surface, is unforgettable. The water temperature in the summer is typically in the high 70s (°F) from the surface to the platforms at 25 feet. A little deeper is a thermocline, beneath which the temperature varies but is typically in the mid-50s (°F) during the summer. The visibility also varies; it averages 30-40 feet but can be as good as 50-60 feet in the winter months when the water is cooler and algae blooms aren't present. Among the attractions found underwater are a school bus, a crane, several boats, a fire truck, a tanker, old cars and several planes, all of which lie at depths between 20 and 100 feet. A jet, added in 2016, is suspended at around 30-40 feet so divers can visit it and stay off the silty bottom. Being suspended also makes the jet look like it's flying through the water; it's a fun swim-through and a great subject for underwater photographers. The jet replaced a helicopter that had been suspended at the spot for years but had begun to deteriorate; it was moved to another location close to the old pump house. The jet is suspended in 30 feet of water; from the bottom it looks like it’s still soaring. In addition to enjoying the sunken attractions, divers can spend hours diving along the pretty rock walls around the quarry, following the old roads past trees and telephone poles to the sunken dynamite shack or visiting the pump house that used to keep the water out of the quarry. The water has a lot of beautiful vegetation and several species of fish, including koi, rainbow trout and largemouth bass. The koi are a little shy and usually hang out around the staircase near the pump house. Many of the attractions can be explored using established routes, and yellow ropes lead from the submerged platforms down to some of the more popular sights. Other attractions such as the trolley, the Army truck and the Helldiver plane are not marked, so good compass skills are useful for finding and exploring them. Several floating docks and submerged platforms are accessible from shore and are great for practicing skills and keeping classes off the bottom. These objects are all marked on the surface by floating balls that can easily be seen from shore. Many fish species, including these bass, live in the quarry. One of my favorite parts of the quarry is the island in the middle near the peninsula side. It starts at 60 feet, and its top is usually only a few feet underwater. It can be seen from shore, especially when the water is really clear. A Cessna airplane sits on the edge of the island at 25 feet and is a great spot for photography. There is also a lot of plant life and young bass that hide in the rocks around the area. From the plane, divers can head straight to the crane or the bus or take a longer swim out to the tanker. Twice a year, on Memorial Day and Labor Day, the North East Diving Equipment Group sets up on the "student side" of the quarry in about 5-20 feet of water and gives the public the opportunity to try diving with hard hats. They bring different ones that they've restored and guide anyone who is scuba certified in donning a Mark V helmet or a more modern Kirby Morgan SuperLite 27. It's a unique experience conducted by a dedicated and fun group of people. Divers come from all over the world during those two weekends just to experience diving with a military or commercial diving helmet or vintage scuba equipment as seen in movies. The school bus is a popular attraction; yellow ropes guide divers from it to other attractions, including a fire truck and a Cessna aircraft. Divers traveling from out of town can either camp at the quarry for an additional fee or stay at one of several hotels in the area that give nightly discounts to those diving at Dutch. On site is an air filling station, a large concession building, clean bathrooms and showers. There are also grills and pavilions available for private events, demonstrations or workshops. The popularity of Dutch Springs is evident when you see the number of people there on a typical weekend. There is a huge sense of community among the divers who gather from all over the Northeast and beyond. This once-active limestone quarry that produced the cement that built the foundations of Bethlehem is now a place that builds the foundations of friendships. Getting there: Located at 4733 Hanoverville Road in Bethlehem, Pa., Dutch Springs is open on weekends from April through November and every day from Memorial Day through Labor Day weekend. Check the schedule at DutchSprings.com. Plenty of parking is available, but it's best to get there when the facility opens to get a good spot. Conditions: Water temperatures can vary from low 40s (°F) in the spring and 50s (°F) on the bottom to the 70s (°F) in the shallows in the summer. 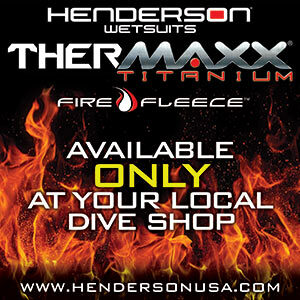 A thick 7 mm wetsuit with gloves and a hood or a drysuit are recommended. Visibility can range from 15-60 feet depending on the time of year, amount of rain and number of divers there. Topside: The AquaPark is a favorite of families. Open Memorial Day through Labor Day, the park has all kinds of aquatic toys to climb on, jump off of or slide from. The blob is the most fun — I had to try it myself this summer, and I've never laughed so hard as I was propelled into the air. Dutch Springs truly has something for everyone who enjoys being on or under the water.